What is an Acoustic Windshield and do They Work? I Have the Answer! Blog What is an Acoustic Windshield and do They Work? I Have the Answer! The new vehicles on the road today are quickly becoming more capable and advance every single year. But I’m sure you already know this of course. Consumers need to be aware that they need to be more careful regarding the repairs and replacement parts. As the parts become more advanced, they also become much more expensive to fix and ultimately replace. One such tech is acoustic windshields, and that’s what I’m going to cover in this article. What is an Acoustic Windshield? An Acoustic Windshield is a windshield with added layers of soundproofing insulation. In between the two layers of glass, there are two layers of Standard PVB and one layer of acoustic PVB in between the Standard PVB making the cabin of the vehicle quieter. You need to be especially careful when replacing the windshield of your vehicle because the repair shop might opt to avoid installing an acoustic windscreen to save a few dollars. Just make sure to tell your dealer you want the same type of windshield that was in the vehicle and not an aftermarket knockoff. Of course, the aftermarket parts are often a fraction of the price of the original. But believe me, you will hear the difference once you’re driving your car with non-acoustic replacement glass. There is no question that these new technologies that are emerging are crucial in maintaining quality and performance. One of those performances is the noise reduction aspects of an acoustic windshield. The acoustic glass is supplied by the original manufacturer to lessen traffic and wind noise. Some windshields of today also have Ultra Violet (UV) reducing sensors that are now growing in popularity. Most of you have probably seen or currently own a vehicle with rain sensors that turn the wipers on automatically. There are also automatic high-beam control sensors on some vehicles. These will dim the headlights from high to low beam when the sensor recognizes an approaching car. All of these sensors are often attached on the windshield. If you want your replacement to perform like your old windshield, then it would be smart to demand an Original manufacturer replacement glass. There are a few ways to tell if you own a vehicle outfitted with an acoustic windshield. One way to know right off hand is by looking at the bottom of the driver side windshield. If there is the word “acoustic” or “A” or even the symbol of an “ear”, then you have an acoustic windshield. 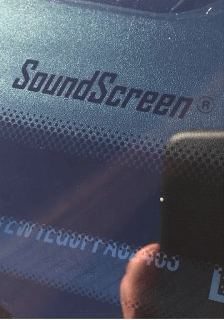 Some windshields will also have a sticker saying “SOUNDSCREEN” (FORD) just like the picture below. It all depends on the vehicle’s manufacturer and model. Recently, PVB suppliers have created vinyl with improved acoustic-damping properties. These new interlayers are especially useful in the 1,500 Hz to 5,000 Hz frequency range. The decibel reduction will be around 2-3 dB overall. Although not a huge difference, it results in a quieter vehicle interior that enables people to speak without shouting. Acoustic vinyl also allows vehicle designers to reduce the thickness of the windshield without adversely affecting noise levels. This is especially significant as automotive engineers try to cut weight off vehicles to make them more fuel efficient. Acoustic vinyl windshields meet all of the same federal safety specs as regular vinyl windshields. Air-pressure changes against the windshield at high speeds. Air hitting on the edges of the vehicle’s body panels. Additional cars and environmental noise. Road noise and vibration are also transmitted within the body of the car. Difference Between a Regular and Acoustic Windshield. Of course, the main benefit of having an acoustic windshield is the noise reduction within the vehicle’s cabin. There are other benefits however that are even more important than noise reduction. One such advantage is the improved integrity of the glass. This makes the windshield more secure and works as a theft deterrent. Acoustic windshields will take much longer to break through the laminated glass, and reduces the chance your vehicle becomes a victim of a “smash and grab” theft. 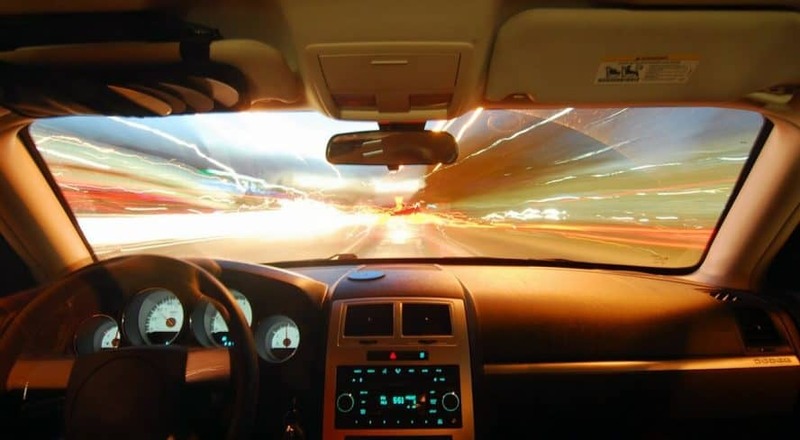 The special laminated glass that comes from an acoustic windshield allows for a reduced amount of ultraviolet raise being transmitted through the glass. People with melanoma will undoubtedly benefit from the reduction of UV raise entering the vehicle. The reduction of UV raises not only help the passengers but also helps preserve the interior of the vehicle from color fading on the dash and leather seats. And lastly, the vinyl interlayer’s lower mass enables vehicle designers to maintain the equal overall window thickness while decreasing the weight of the window related to monolithic tempered glass. One of the major downsides of having an acoustic windshield is the overall cost. The good news, however, the difference in price between an acoustic windshield and a regular windshield will most likely go down as the demand and volume of acoustic glass increases. The types of vehicles on the road today equipped with an acoustic windshield are spread across all sizes and price range. Unlike in the past, the acoustic windshield is not only reserved for luxury vehicles. Modern vehicles use laminated glass, rather than the double glazed windshield. There are several differences between the two types of glass. Double Glazed Windshield; The way the noise goes through a double glazing windshield would be similar to the glazing windows in your home. The glass is formed using two pieces of glass that are separated by an air gap. The reason this type of glass was so heavy is that of each of the two pieces of glass needs to be effective in automotive safety and has to pass all safety test. Laminated Acoustic Windshield; The reason why this type of windshield is lighter is that the sheets of glass are thinner by about 5mm or 4mm. The way this glass is formed is by taking two pieces of thin glass and bonding them together by a piece of plastic. Acoustic windshields have an acoustic film between the two parts of plastic. Double glazed windshields were effective regarding noise reduction was achieved with mass. As we know, more mass usually equals to better soundproofing. 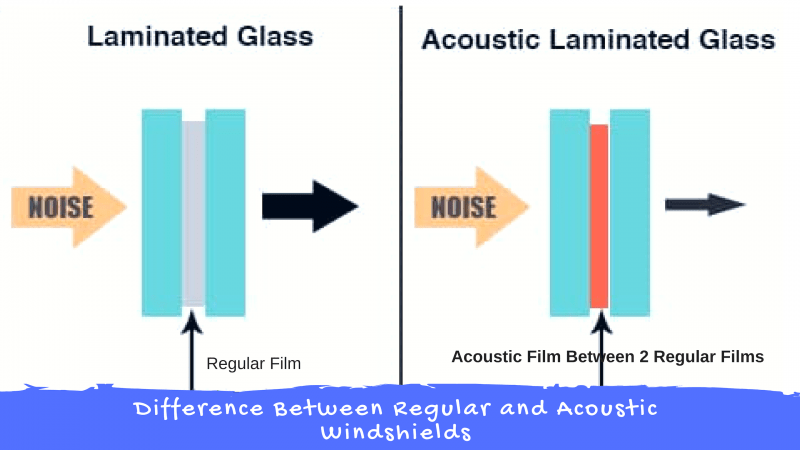 Laminated windshields achieve its noise reduction properties by damping through its construction by using an acoustic film in between the two pieces of glass. The best advice I can give in concluding this article is by advising you first to check if you have an acoustic windshield. Second is to make sure to ask the repair person about the type of windshield you’ll be getting when it’s time for its replacement. Thank you for checking us out and don’t forget to share this article with your friends! Check out our new YouTube Channel for great how-to videos and general soundproofing tips and tricks. 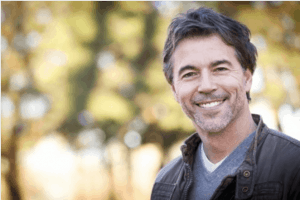 Why do White Noise Machine Help You Sleep? Come and Find Out!